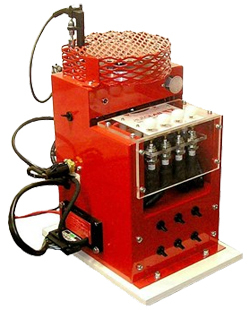 Fully operational Distributorless Ignition System (DIS) Ignition Turret Trainer, manufactured using original components. Based on a Ford DIS Ignition system, complete with Inductive crank sensor, ignition module, coil pack, Temperature sensor, HT leads and 4 x spark plugs. Crank sensor pick-up disc operated via a variable speed control. Inlet manifold vacuum simulated by a syringe. With the use of timing light, advance and retard can be observed on the graduated scale by the timing mark. Variable spark plug gap adjustment, viewed through a clear Perspex cover. Six fault insertion comprising of high resistance and open circuit faults. Turret case mounted on a metal base.